When I started our CPA practice, I kept my full time job working for a technology company. After working nights and weekends for three years, I decided to go full time into our business. I was greeted with some doubters but I found most people to be wonderful supporters. The one thing I had to remember is to ask for their support and help. Very few people will help you unless you ask. One day I see the world having more solo entrepreneurs because it will be easier for people with special talents to be paid what they are worth. Simple for the fact that the speed of the internet has increased so much it does not really matter anymore where you are located. We have clients all over the world. We can do video meetings with people in the Ukraine as easy as they were in our office. If you want a quick side job, you can join uber, lytfe, or elance for a fast opportunity. You just have to be prepared to cease the opportunity. Joining us for our discussion on Solo Entrepreneurship is Marion McGovern who is calling in from her San Francisco office. Marion McGovern was the founder and CEO of M Squared Consulting, one of the first Gig Economy talent intermediaries before the term was even coined. She also founded Collabrus, a company focused on independent contractor compliance. McGovern is the author of A New Brand of Expertise: How Independent Consultants, Free Agents, and Interim Managers are transforming the World of Work. She sits on several private company and nonprofit boards, and actively mentors entrepreneurs in the human capital space. She is a member of the YPO and NACD. 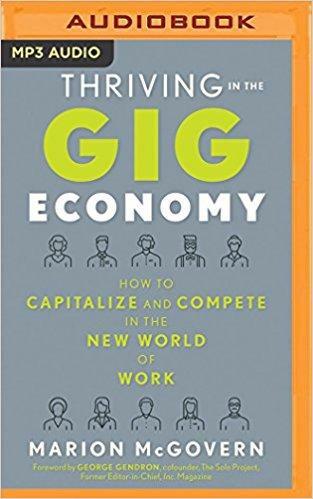 She is the author of “Thriving In The Gig Economy: How to Capitalize and Compete in the New World of Work”Welcome To Mastering Your Money, Marion McGovern.